Coco has called Los Angeles home for nearly twenty years. Always finding the real estate “gems” in each diverse location she has lived, from Atwater to Hancock Park, Mar Vista to the Valley, she has always had a passion for real estate. The purchase of a 1950’s Post and Beam in the San Fernando Valley sparked her interest in California’s signature architectural styles. Originally a mid-westerner and as a mother of four young children, she has a particular appreciation for Valley living, with an abundance of great schools and parks, homes with large lots on wide streets, and where a sense of community thrives. 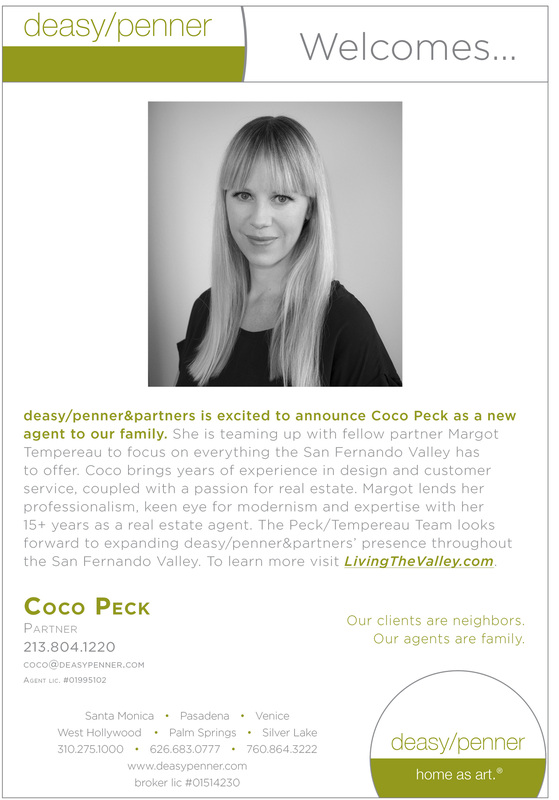 At Deasy/Penner, and in teaming up with modernist specialist Margot Tempereau, Coco offers her unparalleled design acumen, attention to detail, and passion for realizing each client’s home design dreams, coupled with her strong appreciation for Valley real estate, particularly the Valley’s extraordinary array of mid-century modern and ranch style homes and estates.